Either way, the sentiment is meant to set up an image contrast between the shadow of death and the utopian merriment as if the nymphs and swains of ancient Arcadia are thought to embody, although that the meaning of the intricate composition seems to be that the discovery of the art has been the creative response of humankind to the shocking discovery of mortality for the difference in the latter. Accordingly, that death claims to rule even Arcadia is challenged by art, whilst death only usurps its power, is the raison detre to recall with the difference in the former. "Et in Arcadia ego" is a Latin phrase that most famously appears as the title of two paintings by Nicolas Poussin (1594–1665). They are pastoral paintings depicting idealized shepherds from classical antiquity, clustering around an austere tomb. The more famous second version of the subject, measuring 87 by 120 centimetres (34.25 x 47.24 in), is in the Louvre, Paris, and also goes under the name "Les bergers d'Arcadie" ("The Arcadian Shepherds"). The translation of the phrase is "Even in Arcadia, there am I". The usual interpretation is that "I" refers to death, and "Arcadia" means a utopian land. It would thus be a memento mori. During Antiquity, Greeks lived in cities close to the sea, and led an urban life. Only Arcadians, in the middle of the Peloponnese, lacked cities, were far from the sea, and led a shepherd life. Thus for urban Greeks, especially during the Hellenistic era, Arcadia symbolized pure, rural, idyllic life, far from the city. 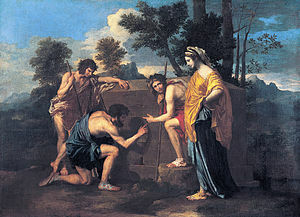 However, Poussin's biographer, André Félibien, interpreted the phrase to mean that "the person buried in this tomb lived in Arcadia"; in other words, that the person too once enjoyed the pleasures of life on earth. This reading was common in the 18th and 19th centuries. For example William Hazlitt wrote that Poussin "describes some shepherds wandering out in a morning of the spring, and coming to a tomb with this inscription, 'I also was an Arcadian'." The former interpretation ("ego" referring to death) is now generally considered more likely; the ambiguity of the phrase is the subject of a famous essay by the art historian Erwin Panofsky (see References). Either way, the sentiment was meant to set up an ironic contrast between the shadow of death and the usual idle merriment that the nymphs and swains of ancient Arcadia were thought to embody. Guercino's version of the subject. The first appearance of a tomb with a memorial inscription (to Daphnis) amid the idyllic settings of Arcadia appears in Virgil's Eclogues V 42 ff. Virgil took the idealized Sicilian rustics that had first appeared in the Idylls of Theocritus and set them in the primitive Greek district of Arcadia (see Eclogues VII and X). The idea was taken up anew in the circle of Lorenzo de' Medici in the 1460s and 1470s, during the Florentine Renaissance. In his pastoral work Arcadia (1504), Jacopo Sannazaro fixed the Early Modern perception of Arcadia as a lost world of idyllic bliss, remembered in regretful dirges. The first pictorial representation of the familiar memento mori theme that was popularized in 16th-century Venice, now made more concrete and vivid by the inscription ET IN ARCADIA EGO, is Guercino's version, painted between 1618 and 1622 (in the Galleria Nazionale d'Arte Antica, Rome), in which the inscription gains force from the prominent presence of a skull in the foreground, beneath which the words are carved. Poussin's 1627 version of the Arcadian Shepherds, in Chatsworth House, depicting a different tomb with the same inscription. Poussin's own first version of the painting (now in Chatsworth House) was probably commissioned as a reworking of Guercino's version. It is in a far more Baroque style than the later version, characteristic of Poussin's early work. In the Chatsworth painting the shepherds are actively discovering the half-hidden and overgrown tomb, and are reading the inscription with curious expressions. The shepherdess, standing at the left, is posed in sexually suggestive fashion, very different from her austere counterpart in the later version. The later version has a far more geometric composition and the figures are much more contemplative. The mask-like face of the shepherdess conforms to the conventions of the Classical "Greek profile". The most important difference between the two versions is that in the latter version, one of the two shepherds recognizes the shadow of his companion on the tomb and circumscribes the silhouette with his finger. According to an ancient tradition (see Pliny the Elder, nat. Hist. XXXV 5, 15), this is the moment in which the art of painting is first discovered. Thus, the shepherd's shadow is the first image in art history. But the shadow on the tomb is also a symbol of death (in the first version symbolized by a skull on the top of the tomb). The meaning of this highly intricate composition seems to be that, from prehistory onward, the discovery of art has been the creative response of humankind to the shocking discovery of mortality. Thus, death’s claim to rule even Arcadia is challenged by art (symbolized by the beautifully dressed maiden), who must insist that she was discovered in Arcadia too, and that she is the legitimate ruler everywhere, whilst death only usurps its power. In the face of death, art's duty—indeed, her raison d’être--is to recall absent loved ones, console anxieties, evoke and reconcile conflicting emotions, surmount isolation, and facilitate the expression of the unutterable. The Shugborough relief, adapted from an engraving of Poussin's second version. The undated mid-eighteenth-century marble bas-relief is part of the Shepherds Monument, a garden feature at Shugborough House, Staffordshire, England. Beneath it is the cryptic Shugborough inscription, as yet undeciphered. The reversed composition suggests that it was copied from an engraving, the compositions of which are commonly reversed because direct copies to the plate produce mirror images on printing. In 1832 another relief was sculpted as part of the monument marking Poussin's tomb in Rome, on which it appears beneath a bust of the artist. In the words of the art historian Richard Verdi, it appears as if the shepherds are contemplating "their own author's death." In conjunction with John Andrew, the artist Ian Hamilton Finlay created a marble carving entitled "Et in Arcadia ego" in 1976. Carved below the title are the words "After Nicholas Poussin". The main part of the carving shows a military tank in a pastoral landscape. While the phrase "et in arcadia ego" is a nominal phrase with no finite verb, it is a well-formed construction because substantive and copular verb omission is perfectly acceptable in Latin. Pseudohistorians unaware of that aspect of Latin grammar have concluded that the sentence is incomplete, missing a verb, and have speculated that it represents some esoteric message concealed in a (possibly anagrammatic) code. In The Holy Blood and the Holy Grail, Baigent, Leigh, and Lincoln, under the false impression that "et in arcadia ego" was not a proper Latin sentence, proposed that it is an anagram for I! Tego arcana dei, which translates to "Begone! I keep God's secrets", suggesting that the tomb contains the remains of Jesus or another important Biblical figure. They claimed that Poussin was privy to this secret and that he depicted an actual location. The authors did not explain why the tomb depicted in the second version of the painting should contain this secret while the distinctly different one in the first version presumably does not. Ultimately, this view is dismissed by art historians. Andrews and Schellenberger selected the proper anagram out of numerous possibilities. Andrews and Schellenberger also claim that the tomb portrayed is one at Les Pontils, near Rennes-le-Château. However, Franck Marie in 1978 and Pierre Jarnac in 1985 had already concluded that this tomb was begun in 1903 by the owner of the land, Jean Galibert, who buried his wife and grandmother there in a simple grave. Their bodies were exhumed and reinterred elsewhere after the land was sold to Louis Lawrence, an American from Connecticut who had emigrated to the area. He buried his mother and grandmother in the grave and built the stone sepulchre. Marie and Jarnac had both interviewed Adrien Bourrel, Lawrence's son, who witnessed the construction of the sepulchre in 1933 when a young boy. Pierre Plantard, the creator of the Priory of Sion mythology, tried to argue that the sepulchre at Les Pontils was a "prototype" for Poussin's painting, but it was situated directly opposite a farmhouse (behind the foliage) and was not in the "middle of nowhere" in the French countryside, as is commonly assumed. Plantard also claimed that the phrase "Et In Arcadia Ego" had been the motto on his Family Coat-of-Arms for generations. The sepulchre was demolished in 1988 by the owner with the permission of the local authorities. Et in Arcadia ego (the German Auch ich in Arkadien! is used) is the motto of Italian Journey (1816−17) by Johann Wolfgang von Goethe. Et in Arcadia ego is the title of section 295, Volume II, Part Two ("The Wanderer and his Shadow"), of Friedrich Nietzsche's Human, All Too Human (1880). The passage describes a pastoral evening scene in the high mountains, finishing with the lines: "Unconsciously, as if nothing could be more natural, you peopled this pure, clear world of light (which had no trace of yearning, of expectancy, of looking forward or backward) with Greek heroes. You felt it all as Poussin and his school felt it, at once heroic and idyllic. So individual men too have lived, constantly feeling themselves in the world and the world in themselves, and among them one of the greatest men, the inventor of a heroico-idyllic form of philosophy, Epicurus." Et in Arcadia Ego is the title of Book One of Evelyn Waugh's Brideshead Revisited in which the narrator, Charles Ryder, describes his room decorated with a skull bearing the phrase. The phrase appears in Cormac McCarthy's novel Blood Meridian when the character Tobin informs The Kid that the phrase is the name Judge Holden has ascribed to his rifle, noting "A reference to the lethal in it." Ben Okri's In Arcadia follows a filmcrew shooting a documentary about Nicolas Poussin's painting. Et in Arcadia ego was the originally planned title of Tom Stoppard's play, Arcadia, in which the phrase is used erroneously by one character (whose misuse is acknowledged by two other characters). The phrase also reflects the themes of the play itself. "Et in Arcadia Ego" is also the title of a work by the Czech science fiction writer Simon Sedivak, where Arcadia is described as a planet. Arcadia was the name of Duran Duran's spin off band formed in 1985 by Simon Le Bon, Nick Rhodes and Roger Taylor reportedly because of the inscription on this painting.